By the mid to late 1990s the genre of horror had threatened to become a cruel parody of itself. Wes Craven’s wonderfully tongue-in-cheek self-referential 1996 feature Scream typified the malaise that the genre found itself in. It wasn’t until Danny Boyle’s genre busting 2002 feature 28 Days Later that horror was taken seriously again. Dispensing with outdated zombie movie clichés, Boyle’s measured direction revived and indeed redefined the entire genre. Intelligent, sophisticated and very scary, 28 Days Later served as a lesson and a wake up call to the film industry into how horror could and should be done. As a result, films such as Saw, Wolf Creek and Hostel have all subsequently enjoyed critical and commercial success, and in the case of Saw and Hostel spawned franchises. Given the success and influence of 28 Days, it seems surprising that a sequel has taken five years to emerge. 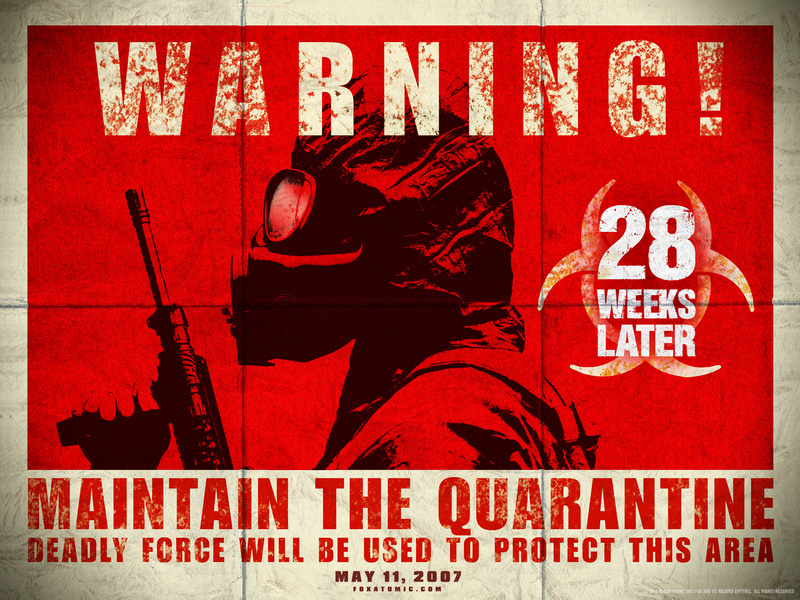 Juan Carlos Fresnadillo, taking over the directorial duties from Boyle (who instead takes an executive producer role alongside 28 Days scribe Alex Garland), picks up the story 28 weeks after the initial outbreak of the rage virus. Britain has been abandoned and quarantined in a bid to eliminate the virus and having seemingly achieved this, U.S. troops are entrusted with the job of repopulating the country. Amongst the first to arrive back in the country to be reunited with their father are Andy (Mackintosh Muggleton) and sister Tammy (a promising Imogen Poots), who we soon learn may or may not hold the key to the eradication of the virus. Having introduced their father Don (Robert Carlyle) in a nerve-shredding prologue that outlines his terrifying escape from the infected, Fresnadillo resorts to a rather clunky plot device that allows Don (an access all areas handyman) to spread the virus within the confines of the safe zone, District 1. From here on in, the plot essentially descends into traditional horror fare, as a motley crew of survivors (complete with predictable cannon fodder) led by skeptical medical officer Scarlet (Rose Byrne) and combatant with a conscience army sniper Sgt. Doyle (Jeremy Renner) attempt to escape to safety with Andy and Tammy. What elevates 28 Weeks Later above the norm are the occasional, considered and insightful questions that Fresnadillo raises. In particular, a harrowing scene following the outbreak of the virus draws upon the galling realities and moral tribulations of urban warfare, as soldiers are ordered to fire indiscriminately upon crowds of people, infected or not. In addition, the brutally apocalyptic carpet-bombing of the Isle of Dogs is as traumatic as it is visually impressive. Boyle’s obvious influence on Fresnadillo is apparent throughout. From the beautifully shot vistas of a desolate and deserted London (including a particularly symbolic scene of Andy and Tammy driving a moped through a cemetery), to the hugely immersive jerky first-person camerawork, Fresnadillo doesn’t miss a trick. A silent scene backlit by strobe lighting is so tense it is almost unbearable to watch, whilst another inventive and atmospheric scene (that will invariably invite comparisons to Silence of the Lambs) is shot entirely through the night vision crosshairs of a riflescope. Paradoxically, 28 Weeks does on occasion slip into more conventional blood-and-guts fare. The particularly gruesome helicopter rescue scene that is heavily indebted to the infamous lawnmower massacre in Peter Jackson’s Braindead, betrays Fresnadillo’s willingness to embrace some of the more traditional aspects of the genre and pay homage to some of horror’s finest moments. Whilst the film is undoubtedly stunning to look at and incredibly gripping it just doesn’t feel as fresh and innovative as Boyle’s 28 Days. While Fresnadillo does attempt to touch upon the more serious themes of morality and family loyalty, 28 Weeks is effectively a chase movie that is ultimately only saved from a predictably hackneyed ending by its unexpected pitch-black denouement.